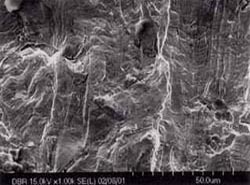 Microstructures which are typical of transgranular stress corrosion cracking were observed. 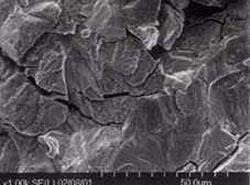 The crack origin was recognized as intergranular stress corrosion cracking starting from pitting, and quasi-cleavage type cracking was observed on the fractured surface, it was a result of transgranular stress corrosion cracking. From the wet chemical components of the adhered dust, 15% was determined as chlorine content, while 8 to 9% was determined as moisture content. The air intake area showed the most prevalent cracking, with no cracking generated in high temperature portion. When using SUS316, stress relief annealing is needed to reduce the residual stress. The surface temperature is considered low when between 100 and 150 ℃, so ferritic stainless steel may be adopted for use.